Baking bread is something that scares a lot of people. The chemistry and craft involved in each stage of weighing, kneading, proving and baking can seem like a daunting task, so it’s important to approach the process with some background knowledge, and even a guide to hold your hand. When I first embarked on the mission of making my own bread, my helping hand existed in the form of the River Cottage Bread Handbook. I’ve sung its praises countless times on this blog; from simple wholemeal loaves to home made croissants, this lovely little book will guide you through the world of baking in a simple, straightforward way. If you’re a regular reader of this blog, you’ll know that I’m also a massive fan of Guardian columnist and baking guru Dan Lepard; I’m yet to make a recipe of his which hasn’t turned out wonderfully. But there’s one more person I’d like to add to this list, completing a holy trinity of baking brilliance – award winning chef, baker and all round good guy, Richard Bertinet. When I first joined Twitter back in March this year, Richard was the first person ever to follow me. ‘Show some love to this lonely little loaf‘ I believe were his exact words, and this generous, supportive attitude is one that shines through in his approach to learning to bake. His book Dough – and accompanying DVD – use step-by-step pictures and simple techniques to guide the reader through each stage of the baking process, and with gorgeous photos to accompany each recipe, there’s not a single loaf I wouldn’t want to bake. 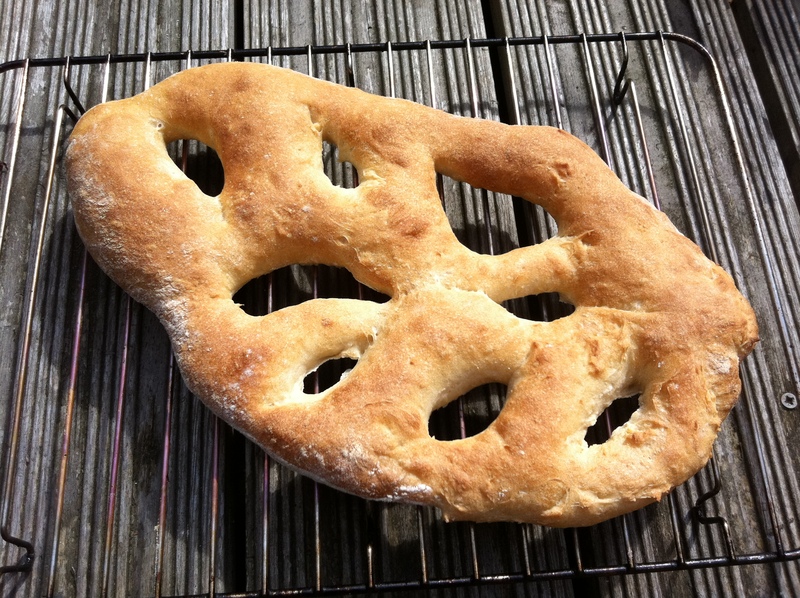 This month’s Fresh from the Oven challenge from Claire at Purely Food is inspired by one such loaf; fougasse. In his introduction to the recipe, Richard explains that this is one of his favourite loaves to teach beginners as it is both simple to make and impressive to look at. There’s something so satisfying about taking beautifully baked home made loaf fresh from the oven, and if you’re new to baking I urge you to try this recipe; it really is so simple. Fougasse is a flat bread particularly associated with the Provence region of France. Derived from the Latin word for focus, meaning hearth, it has the same etymology as the popular focaccia, however unlike its more yielding, oily Italian counterpart, fougasse is crunchy on the outside and soft on the inside. Little slashes across the loaf mean it’s easy to tear into fingers, making this the perfect bread to share, and the mild flavour and flat surface make fougasse ideal for adding different flavours and toppings to. I made two large loaves from the batch of dough, baking one plain and topping the second with tiny little tomato halves. Next time I’d like to try a combination of thyme and caramelized red onion, but you can really let your imagination go here; cheese, bacon, olives, herbs or even spices would work well – I’m thinking a sprinkle of za’atar or oregano and a drizzle of olive oil, before serving with some crumbly goats cheese and a simple salad. What’s your favourite type of loaf? Do you have a friend, relative, teacher or chef who has inspired you to bake? 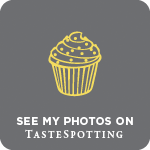 And if you don’t already bake, might this post inspire you to have a go? Preheat oven as hot as it will go and pop a baking stone or tray in to warm up. Mix yeast into the flour, then add the salt and water. Mix for a couple of minutes with a flat scraper until the dough starts to come together. Transfer the dough onto your working surface. Continue to mix the ingredients by stretching out the dough and folding it over onto itself. Keep working the dough until it comes cleanly away from the work surface and is not sticky. Lightly flour the work surface, place the dough on the flour and form into a ball. Place the ball into a dry mixing bowl and cover with a black plaster bin liner. Leave to rest for one hour minimum. Once doubled in size, turn the dough out gently onto a well-floured surface, being careful not to deflate it. Generously flour the top of the dough, cover with a clean tea towel and rest for a further five minutes. Using a plastic scraper or spatula divide the dough into two oblongs. If making four loaves, cut each piece in half again. Make one large diagonal cut in each piece of dough, making sure you cut right through to the work surface but not through to the corners. Make 3 smaller diagonal cuts on each side of the central one. Gently open out the holes with your fingers and shake off the excess flour. If adding any toppings, this is your moment – caramelized onions, halved cherry tomatoes drizzled with oil and sea salt, rosemary, thyme and olives would all be delicious. Lift onto a lightly floured baking tray and slide onto the hot baking stone or tray in your oven. Mist your oven with water spray to help achieve the perfect crust, then bake for 10 to 12 minutes until golden brown. Serve whilst still warm, or reheat at a low temperature if serving later. It does look nice – would I get away with using just the dough hook on the kichen aid – I’m slightly adverse to the hard work of kneading. Thank you for taking part this month. Your fougasse look fantastic. I love the River cottage bread book too but no fougasse in there! We always buy fougasse from the markets in France – there’s one stall that has about 50 different fillings and has the biggest queue even though it doesn’t look half as nice as yours! I am a fougasse lover and I like yours two ways! Especially with the sundried tomatoes! I’m a big fan of Dan Lepard too. I had the great pleasure of meeting him at the Oundle Food Festival, such a nice chap. I think the River Cottage Bread Book is the best thing you could own as beginner, it’s informative without being overwhelming. I have to admit I was sadly unaware of Richard Bertinet before this challenge but you’ve convinced me to buy Dough. Two beautiful loaves & an inspiring post. 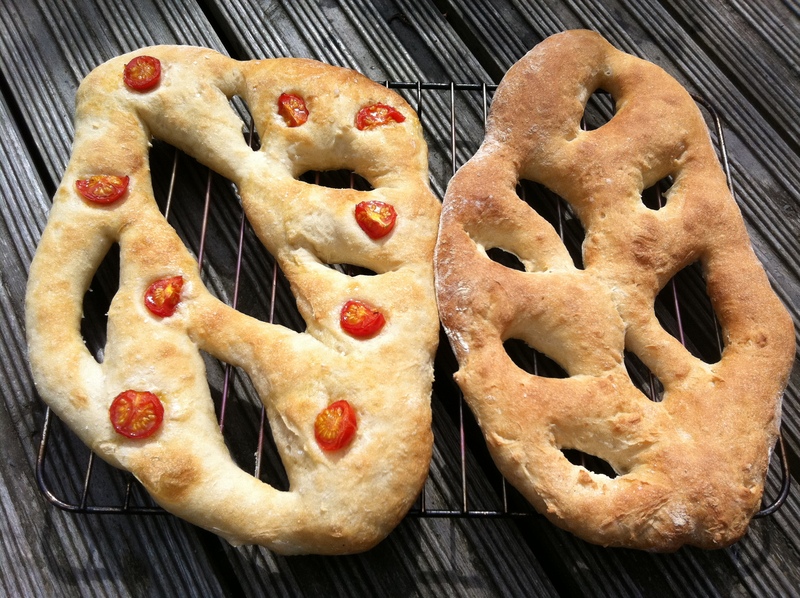 Your fougasse looks great! I love the idea of topping it with tomatoes. Who doesn’t love a fougasses? Looks absolutely fantastic, can’t wait to give it a go if I get a chance this weekend. The bread book is the only one of the river cottage handbooks that I don’t have, might need to get clicking on the ol’ amazon. Warm Snug Fat – sadly I don’t own a Kitchen Aid (although it’s on my Christmas wishlist!) but I’m sure you can get away with the dough hook on your mixer! London Bakes – aw, thank you 🙂 50 fillings sounds pretty amazing! Lavender & Loveage – yep, I reckon the tomato version was my favourite too. Dear Love Blog – I do think Dough is worth investing in – you get a free DVD showing how to do Richard Bertinet’s alternative to kneading too! I’m with you on the holy trinity of baking and would love to do one of Richard Bertinet’s courses next year. 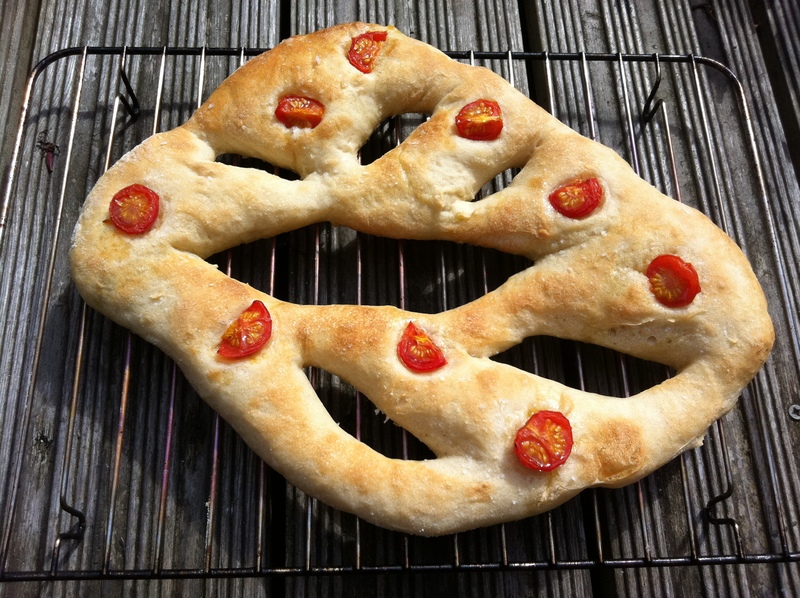 Love the pretty tomato version…I think I might have to make another fougasse at this rate! Not Quite Nigella – the bread is always my downfall in nice restaurants…if it’s good it’s hard to remember to leave room for everything else! This bread looks phenomenal! And I love the idea of the fresh from the oven challenge, I think maybe I’ll take part. You should definitely get involved, it’s so much fun and really challenges you to think outside your normal baking parameters. This has inspired me- thank you! My favourite loaf is Irish soda bread- and the quantities it that I can eat are frankly terrifying…. I’ve never heard of Fougasse until your post. Your’s looks great!! I will have to check out the River Cottage Book because I love Hugh’s show. As for my favourite bread, that is definitely rye bread, in particular dark rye. Yum!!! This looks delicious! I love the 2 ways of presenting it. the one with semi-dried tomatoes looks really cute! We bought the Dough book recently and I thoroughly recommend it. We made the cider rye bread first and it was outstanding. I made fougasse this week. So simple and so delicious. 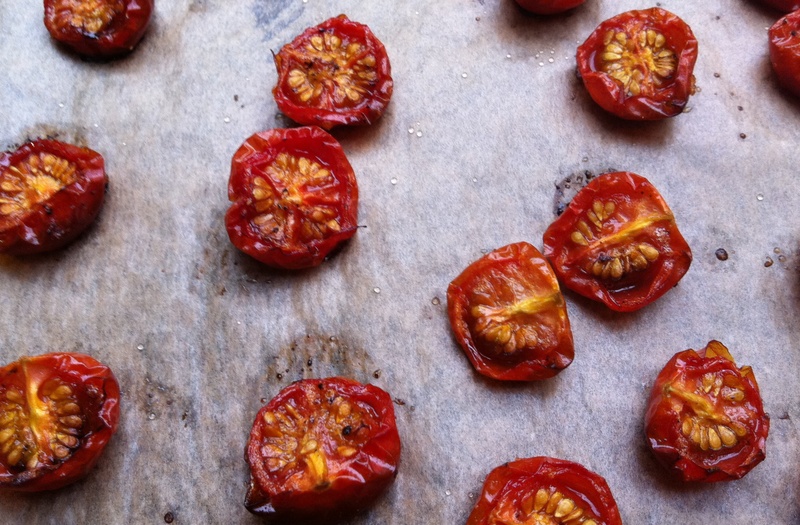 Love your photos and I may try your tomato idea next time. For those asking about using a dough hook – yes you can (RB says so!) – 2 minutes on speed 1 to mix everything together, then 6 to 7 minutes on speed 2. Worked for me! Also, you can freeze the par-baked dough which I thought would be useful to share – bake as above for 6 minutes then cool. Pop it in a freezer bag. Cook from frozen at 280 – 200 C for 12 minutes.